A latent Inhuman whose supernatural abilities were triggered by way of exposure to the Terrigen Cloud. Transformation did not alter his physical form and bestowed unto him the powers of aerokinesis (or the ability to telekinetically create and manipulate powerful vortexes of spinning winds). Prior to Terrigenesis, Über Alles (whose human name has yet to be revealed) had been the leader of a violent group of vicious, neo nazi criminals. An especially unintelligent young man, he failed to realize he is an Inhuman and believed his newfound powers were a gift offered to aid him in his racist cause. He chose the name ‘Über Alles’ which is a German phrase meaning ‘above all’ and harkens back to nazi propaganda regarding the alleged superiority of aryan people. Located in an unspecified city in Germany, Über Alles’ gang committed numerous acts of terrorism, ultimately earning the attention of the German hero known as Iron Cross. She engaged Über Alles and his gang inside an old church and tremendous battle ensued. Iron Cross was soon aided by her fellow heroes among the All New Invaders. Just when it appeared as though the battle was going the heroes’ way, the renegade Inhuman known as Lash teleported onto the scene. Lash stated that he had come to recruit the Inhumans Iron Cross and Toro to his cause. Lash additionally recognized that Über Alles was an Inhuman and offered him a place in his tribe as well. Über Alles was greatly dismayed to learn he was an Inhumans. His Inhuman lineage flew in the face of his erroneous notion of being of some kind of ‘pure’ bloodline. As Über Alles grappled with this harsh realization, Lash took on Iron Cross and her New Invaders. The powerful Inhuman was proving too much for them, but fortunately Medusa and her own Inhumans entered into the fray and was able to turn the tide against Lash. Realizing he was outmatched, Lash decided to flee. He once more offered a place for Über Alles among his tribe. This time, the young man agreed, having suddenly decided that the Inhumans were the ‘true master race’ and that he belonged with them. Lash teleported Über Alles back to Orollan where he was made a member of Lash’s tribe. Presumedly, he is still located on Orollan, but his current status remains unknown. Über Alles first appeared in All New Invaders #14. An Inhuman scientist who conducted extensive research on the effects of Terrigenesis. Ultarnt lived on Attilan some two centuries ago and she tirelessly cataloged the various different types of mutations, abilities, and power-sets that came about by way of the Terrigen Mists. The common consensus was that Terrigenesis was influenced by the specifics of bloodlines and genetic predispositions, variables that could be manipulated by way of arranged matings and the practice of eugenics. Ultarnt suggested a different theory; she posited that the effects of Terrigenesis were actually influenced by situational factors. According to Ultarnt’s theory, exposure to the Terrigen Mists created beings whose powers best adapted to the needs of the Inhuman people as a whole at a given time. For example, during times of war and upheaval, Terriegenesis was more likely to produce powers well suited for combat and survival. Whereas during times of peace, Terriegensis tended to endow gifts better inclined toward the arts, medicine and communication. Ultarnt’s theories were in stark contrast to the governing principles of eugenics as advocated by the Genetic Council. And yet her findings did appear to be supported by her statistical analysis. Going against the Council ended up ruining Ultarnt’s standing in the scientific community on Attilan. She found herself something of a pariah, forced to conduct her research in private. Only a handful of Inhuman historians and scholars still recall Ultarnt and her ideas; reading her works remained an act as hearsay in the eyes of the Genetic Council. Many years later, Karnak would become a dedicated proponent of Ultarnt’s theories. Having studied her work, Karnak became convinced that the specific nature of the transformations of new Inhumans were a reflection of environmental circumstances; and could even be seen as predictive of potential threats facing The Inhuman peoples. Ulysses Cain and young latent Inhuman whose powers were triggered into bloom by way of exposure to the Terrigen Cloud. Ulysses had grown up in Ohio and was a student at Ohio State University when he was expose to the cloud. Terrigenesis did not alter Ulysses’ physical appearance and endowed him with the ability for a specialized type of prognostication that has come to be known as ‘Diagnostic Precognition.’ Ulysses’ mind appears to take in massive amounts of ambient information. All of this data is then processed by way of statistical analysis into a variable of probability. The whole process occurs on an unconscious level and, when the analysis ascertains a significant threat, Ulysses experiences the potential future event as a visceral vision, an experience that is seen and felt. When such a future event is especially dire, the visions that Ulysses experiences are telepathically shared by anyone in his immediate vicinity so that they see and feel the same vision of the potential future.It was impossible for Ulysses to control these visions. He was sure he was losing his mind. He was sought out by Queen Medusa and the Inhumans of New Attilan who offered to help Ulysses learn to master his newfound abilities. Ulysses accepted this offer and Medusa brought him to Karnak at the Tower of Wisdom. Karnak trained Ulysses. At first this training was quite harsh and Karnak’s grim philosophy was off-putting to Ulysses. Yet there was a method to what felt like madness… Ulysses’ visions of the future are not pure predictions but rather a complicated algorithm of analysis. Like any statistical analysis, the interpretation of the results can be confounded by personal bias and attitudes. Karnak indoctrination of Ulysses into his nihilistic outlook, his notion that all lives are equally meaningless in the end, was meant to disabuse Ulysses of bias and prejudice so that his visions might be more accurate and unencumbered by bias. To what extent Karnak’s training has been effective is this regard remains to be seen. The meditational exercises that Karnak has taught Ulysses has allowed him to feel more in-control of his visions. With concentration, Ulysses has learned to essentially ‘pause’ his visions so to more greatly explore them, pick out specific details, and hence improve their accuracy. Shortly after this training Ulysses experienced a particularly intense vision of a potential future where the earth was ravaged by a celestial-like monster. Medusa presented Ulysses’ findings to Captain Marvel (Carol Danvers) who them mobilized the Avengers and other heroes to intercept this monster when it appeared. Having the advanced warning proved pivotal and, with he advantage of time to prepare, the heroes were able to repel the monster quickly and effectively as soon as it arrived. Although pleased by their victory, many of the heroes remained a good deal suspicious over how this new Inhuman had been able to warn them of the oncoming threat. Iron Man (Tony Stark) was especially intrigued by the nature of Ulysses’ powers. Stark asked Jean Grey of the X-Men to read Ulysses’ mind so to assure the young man’s good intentions. Ulysses agreed to this yet it turned out that his mind was impenetrable to telepathy. Captain Marvel was convinced that Ulysses’ abilities could be utilized, while Iron Man remained suspicious. Some time later, Ulysses experienced a new vision in which the intergalactic despot, Thanos, came to earth in search of the cosmic cube. Medusa brought Ulysses to Captain Marvel to share this vision and Danvers assembled her team of Ultimates to intercept Thanos when he arrived. In the end, the Ultimates were able to defeat and apprehend Thanos, but the history came at a high cost. The hero, She-Hulk, was badly injured and War Machine (James Rhodes) was killed during the battle. Rhodes had been Tony Stark oldest and dearest friend and the news of his death was devastating for Stark. Stark’s grief acted to further compound his suspicious distrust of Ulysses. Acting on rash impulse, Stark donned his Iron Man armor and broke into the royal palace of New Attilan. He abducted Ulysses and took the young man to one of his laboratories. There Stark subjected Ulysses to a series of tests so to ascertain the exact nature of his powers. In so doing Stark learned that Ulysses’s predictions were the result of an uncanny process of statistical analysis of probability. To Stark’s thinking, this made Ulysses’ powers unreliable and too vulnerable to confounding variables. He was convinced that utilizing these powers to prevent crimes and tragedies was not a viable option. The Ultimates and The Inhumans rescued Ulysses from Stark and Captain Marvel was able to convince Medusa to stand down and not extract immediate vengeance on Stark for his transgression (she would do so anyway later on). Stark’s misgivings notwithstanding, Danvers remained steadfast to the idea that Ulysses’ powers must be used to protect lives and avoid disasters. Ulysses worked closely with The Ultimates as Captain Marvel put together a ‘predictive justice’ initiative whereby the young man’s visions were used to prevent crimes and accidents before they happened. This initiative was largely successful and many crimes along with minor and major disasters were avoided. And yet a growing schism was manifesting among the superhero community, with many feeling that the predictive justice program was a good strategy and many others feeling that it was a bad idea and that it infringed on the civil liberties of the people it effected. This schism came to a head when Ulysses had a vision that The Hulk (Bruce Banner) would go on a rampage that would claim hundreds of lives. The heroes converged on Banner to try to make sure that this terrible event would not occur. Banner had previously entered into a pact with Hawkeye (Clint Barton) in which Barton promised to kill Banner if he ever again lost control and turned into the Hulk. Banner had fashioned Barton with a specialized ‘gamma-arrow’ that would prove lethal to the Hulk. During the encounter with the various heroes, Banner started to become flustered. He grew angry and it looked as though he was about to transform into the Hulk. Before he could, however, Barton shot the specialized arrow and killed Bruce Banner. Barton was eventually acquitted of the charges of murder in Banner’s death, but the whole ordeal had fully crystalized the divide among the heroes. The side led by Iron Man decided that the predictive justice program had to be shut down and this ultimately resulted in a massive battle of hero versus hero. 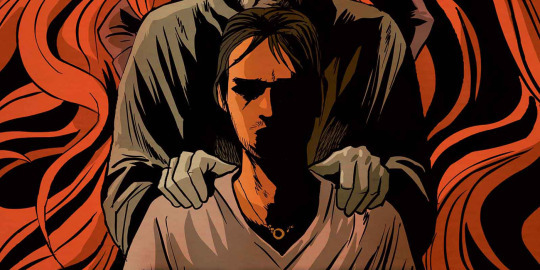 Ulysses’ fate is set to be told in the final chapters of the Civil War II series, scheduled to conclude this winter. The Inhuman who would ultimately be known solely as ‘The Unspoken’ was a regent king of Attilan who took the throne after the death of King Agon. Agon’s son, Black Bolt, was deemed too young and inexperienced to ascend to the throne and hence The Unspoken was asked to rule as a custodial regent until Black Bolt was old enough to be crowned… yet it proved that The Unspoken had never intended to abdicate the throne. The Terrigen Mists endowed The Unspoken with the power of ‘fluctuating Terrigenesis,’ the ability to alter his body into any form he wished and draw from a plethora of different powers and abilities. In order to maintain this formidable power, The Unspoken needed to regularly ‘feed’ on Terrigen Crystals. Repeated exposures to the Terrigen Mists afforded The Unspoken new manifestations of power. Yet these powers would quickly wane without continued exposure to the mists.Power-mad and despotic, The Unspoken tried to change Attilan into a tyranny. The young members of the Royal Family confronted The Unspoken, demanding he step down. Bemused, The Unspoken agreed to take on Black Bolt in single combat with he victor rightfully winning the throne. Black Bolt ultimately prevailed in this battle and the defeated Unspoken was banished from Attilan. So dishonorable were the actions of The Unspoken that Black Bolt had his very presence removed from the history off Attilan; it was decreed that his name never be uttered again (hence causing him to be referred solely to as “The Unspoken”). It is unknown what became of The Unspoken once banished from Attilan. Many years passed and somehow The Unspoken came across a newfound cache of Terrigen Crystals. He used these crystals to reinvigorate his powers and then returned to Attilan and conquered the city. After a tremendous battle, The Unspoken was once again defeated, this time with the aide of Hank Pym’s Mighty Avengers. The Unspoken was seemingly killed, but he actually escaped. Following the Infinity Event and the establishment of New Attilan in the Hudson Bay, The Unspoken once again returned. Drained of his powers, he now resembled a withered old man. Black Bolt had appeared to have perished and The Unspoken proposed to Medusa, offering to become her king and assist her in leading The Inhumans. Medusa refuted this offer and had The Unspoken imprisoned in the bowls of the city. All this was in accordance to The Unspoken’s plans. He had hoped to be imprisoned. Even in its dilapidated shape, The Unspoken knew Attilan quite well. He was able to escape his cell and make his way to a deep alcove where a secret stash of Terrigen Crystal could be found. With these crystals, The Unspoken was once again endowed him with tremendous abilities. Empowered, The Unspoken took over New Attilan and deposed Queen Medusa. Fortunately, The Unspoken’s reign over New Attilan was short lived and he was defeated by the new Inhumans, Inferno, Naja, and Flint. Drained of his powers and once more enfeebled, The Unspoken was again imprisoned. More recently, The Unspoken was freed by Maximus and retreated to parts unknown. It appears as though the renegade Inhuman has a role to play in Maximus’ schemes that are set to unfold int he pages of the Inhumans versus X0-Men event. Stay tuned. 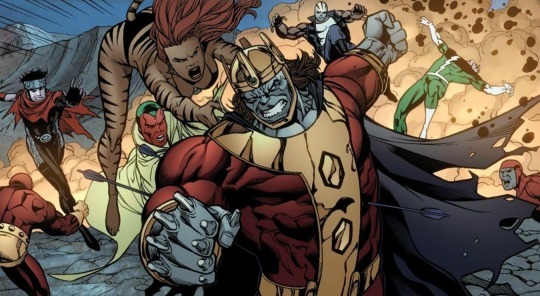 The Unspoken first appeared in Mighty Avengers #27. The father of Rexel Toiven. Usurieus was a citizen of old Attilan with ambitions of working his way into the upper aristocracy. He had high hopes for his son, Rexel, on the eve of his son’s Terrigenesis. He believed that, were the mists to transform his son into a mighty being able to serve in the Royal Guard, then certainly it would greatly assist his own aspirations. Unfortunately, Terrigenesis did not bestow Rexel gifts viewed as especially desirable among the culture of Old Attilan. He was changed into a diminutive figure, with a seemingly useless third arm and the ability to manifest intricate tattoos onto the people’s skin. Although this ability would make Rexel something of a popular practitioner among the Attilan subculture, it did quite little to enhance his father’s social standing. And Rexel and his father quickly became estranged from one another. During an attack by human forces, Rexel threw caution to the wind and ventured out into the battlefield. He ended up saving a number of his fellow Inhumans before he was killed. Later, a statue commemorating his valor was erected in the main Attilan Square. Rexel’s mother came to see the statue and possibly find solace in her son’s heroism, but his father did not and Usurieus current status and whereabouts remain unknown.